I love battery chargers. I had one that went with my first ever digital camera, but when the camera became obsolete I got rid of it. 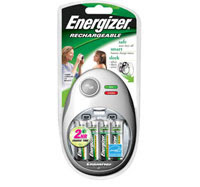 I'd love to win this Energizer one, though, to help power my extra-and-for-special-occasions-alarm-clock. I only set it when there will be dire, horrible consequences if I don't wake up on time (less than half of the time, I swear!). And it's good to have a battery-powered back-up in case of power outages. +1 I follow in Blogger. This would be lovely for my digital camera! I used to have a lot of rechargable batteries but over time I am down to just 8 AA batteries. I would love to have this to power up my CD player that I listen to Audio books on everynight when I go to bed. Or my digital camera. I'd power up ALL The toys my son has! I just got a new digital camera for my birthday and it takes double a batteries! I need a recharger badly! My flashlights, all 5 of them, one for each bedroom, the living room, and family room. My tv remotes! It always seems theres one remote thats on low battery and it drives me nuts! I'd like to try them in my digital camera. I've been needing a charger! I had one and I left if in the hospital when my sister had my nephew! (almost 2 yrs ago!) I would love to have it to charge the batteries for my camera! I would use it to power up batteries for all of my little boys toys (and there are a lot of them). Thanks for the great giveaway! My daughter has a winnie the pooh nightlight that displays pictures on the ceiling. If that thing runs out of batteries we are ALL in big TROUBLE! I could really use this for my Brother Label Maker. It uses 6 batteries at a time and this would sure help on the expenses. Thank you so much! I would definitely power a little bedside light(when I buy one) so I don't have to keep getting up when I'm done with the light across the room. All of my battery-operated kids' toys! I'd use this to recharge batteries for two things- a little remote control fire truck that belongs to my son- great fun, but boy does it eat batteries! And my pocket digital video camera, also a big battery hog. I still use my walkman and the rechargeable batteries will be used for that! This would be fabulous to use with my handy dandy little point and shoot digital camera. Thanks for the opportunity. Great for the environment and for taking pictures without worrying about missing a shot bc I forgot to get new batteries. Thanks for the chance! The Wii remotes for sure! I'd love it for our Leapster! I would use these for my digital camera. 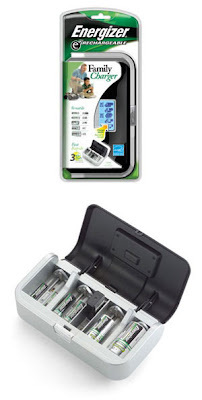 These would be great to charge the batteries on my digital camera, as well as my daughter's digital camera. Thanks. I sure could really use this for my digital camera.